Secluded, semi-private beach! The feel of Maui on Island of Oahu - On the Ocean! Recently remodeled condo with full-size gourmet kitchen and everything you could want or need to just sit back and relax. Linen's provided, security gated free parking off street. Secured access to entire facility with 24/7 security. Awesome space for those who want a quiet time of relaxation while being only 45 minutes from the hustle and bustle of the Waikiki scene. Breath-taking sunsets and glorious moon-sets. Grab your beach chair and cold drink and take the elevator down to the beautiful yet isolated sandy beach. Our white sandy beach is the best kept secret on the island! This condo is on the sunny side of the island better known as the Leeward side - NOT the rainy side called the windward side. Don't risk a vacation where you may or may not see the sun. Even when it is rainy in Honolulu, it is almost always sunny in Makaha. Beautiful spot - perfect for lasting memories! This has to be the paradise of a true Hawaiian experience. There are also 2 newer BBQ's provided downstairs with coin operated laundry room and outgoing mail slots. This area is not in the hub of busyness and offers beautiful white sand beaches waiting to be explored by you. Golfing is just two miles away with Ko Olina and Kapolei courses just 15 minutes away. We are located near the World famous Makaha Surfing beach with huge waves for the surfing competition every winter. Waikiki is just 45 minutes away so you can explore during the day and return to your heavenly retreat in the evenings. Most of the time there is fewer than a handful of people on this beach called Turtle Cove. Yes, come swim with the local giant turtles, snorkel with beautiful fish and watch for the whales swimming by (in Season) and if you're lucky a local monk seal might decide to join you and come ashore for an afternoon nap. We are Jim and Cris Cote'. We live just 3 minutes from the Cabanas and are available to help with all of your needs. Previous trips to Hawaii, we rented a hotel, but decided we wanted something more intimate. We found it. Our first experience at the Makaha Cabanas was when we rented a unit through VRBO. We instantly fell in love. Quiet, comfortable and stunningly beautiful. This truly is paradise on earth. You can't rent a hotel anywhere near as nice as this, nor anywhere as economical. This beach is truly a gem. Very few people. Sunny almost all the time. Whether you sip your morning coffee on the lanai or have a sunset dinner, our 3rd floor view makes you feel like you are right on the beach. Great surfing waves when surf is up. Good snorkeling area. Great view of the whales when they are here in Winter. Very comfortable condo unit for 2 people with up to one or two small children.Gourmet chef's kitchen saves you tons of money eating out, though you can still go into Waikiki or Kapolei for dinner at a nice restaurant. Truly the best value on the island. Memories for a lifetime. Take the elevator down to the ground floor and step onto the beach. Not more than 50 paces from the condo to dip your toes in the rolling waves of the Pacific Ocean. You might swim with a turtle! 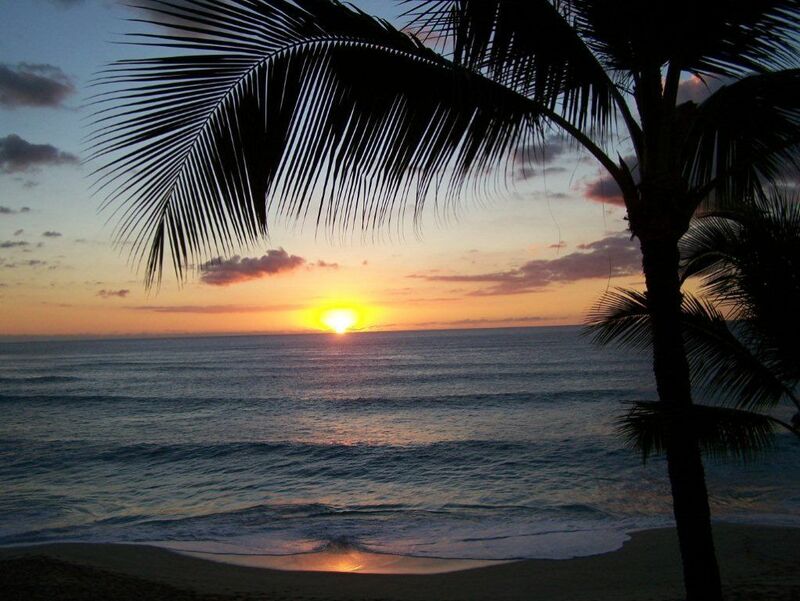 A different and spectacular sunset almost every night to view right from your lanai. We are right on the beach where the trade winds provide a near constant breeze - plenty of air conditioning. (8) coin operated located on first floor. Located near elevator and mail. Convection over - the best! bar-side/small table provided with 4 chairs. rentals available, along with surf boards and paddle boarding. Boat Harbor with in a five minute drive. Just off your bedroom room for four to eat. within minutes, and two courses with in minutes in KoOlina and Kapolei. If it's relaxing your looking for, and adventurous beach combing, swimming, surfing or just relaxing away from all the hustle and bustle then Makaha Cabanas is the place for you. First off, the view was gorgeous if you are looking out from the lanai. But if you drive less than a mile from the condo, then you are met with very unattractive homeless tent communities. We were completely and utterly disappointed by the lack of no air conditioning in the unit. Although the description under amenities clearly states “A/C”, you will find 2 half working ceiling fans and 2 floor fans. Even contacted owners who verified lack of A/C and they stated that they “open back door, windows and turn on fans”. Don’t expect to relax with a tv in the evening as it is difficult to figure out the system as a “tenant” hooked up the new cable system and the owners do not know anything about the new cable system. Under good traffic conditions the airport is about a 45 minute drive, with Waikiki being around an hour. However we left at 5:30 am and it took 2 hours to get to Waikiki one morning and the next morning left at 4:30 and it took 1 1/2 hours. Returning from Waikiki between 3 and 4:00 pm is a 2 hour drive. Once you are off the interstate to get to the condo, there are 30 stoplights that are not synced in a 12 mile stretch with the speed limit ranging between 25-35 mph. Parking at the condo was changed from the time of booking until we arrived. At booking it was shown to have gated and secured parking. Then it was requested To park our vehicle outside the gate, of which there was street side unmarked parking that would hold 3 vehicles. Security stated that you must register your vehicle if you are staying at the complex and for safety concerns. So our vehicle was registered. If you are looking for a secluded area and don’t plan on leaving to go anywhere, this is for you. This place is stocked with a full kitchen and beach toys galore. But bring your A/C. Communication with host while using condo when needing assistance was greater than 24 hours. One star rating for the view! Have pictures but unable to submit. Wow! Never have had a one star review before! The trade winds which are nearly constant in Hawaii are all that is needed for A/C as 95% of all the units are all cooled the same way. If you want to be near Waikiki, I agree our condo is not the place for you. If you will go into Honolulu routinely, I suggest you stay in Waikiki, but look to pay about 3 times the rent. If you want a beautiful beach at your back door, awesome sunsets over the ocean every night and a quiet slow pace vacation at these outstanding rental rates, this is the place for you. By the way, we offered to refund 100% and have these folks stay somewhere else. They refused our offer. Great beach without all the people. Enjoyed the lanai every morning and evening. Watched sea turtles most every morning. Condo had everything we needed. Amazing view from the Lenai. There’s a full kitchen, so I didn’t have to go out to eat. The beach was never crowded. I swam with turtles every day. Check out Ka’ena Point State Park it’s only 6 miles north. Electric beach (Big Factory by the highway) is south of the condo. Amazing snorkeling there. Lots of hiking close by. Wai’anae Boat Harbor is a mile south of the condo as well. I have enjoyed a dolphin snorkeling trip as well as a fishing charter out of there. Lots of fun to be had on the west side of the island. And this Makaha condo really ties it all together. The sunsets are amazing the condo was just as listed. I will definitely revisit this location. This was our first time to Hawaii and first time trying out HomeAway as well. Perfect first experience. The unit was clean and well kept. Clear directions for check in and check out. It was useful to have beach chairs, umbrellas, and boards to play with. The scenery was breathtaking. You could just relax and enjoy the view from your lanai. Sleep to the sound of waves and wake up to the sound of waves. Owners/managers were really helpful when we had questions, but very respectful to give us privacy. We truly enjoyed our time there and would love to rent this place again! Thank you for allowing us to rent your place! You folks were great as well. Thanks for choosing to stay with us. Whale watch from your lanai during winter months. Watch beautiful sunsets every night. Suntan with the gigantic sea turtles when they are on beach. Peace and quiet, but the hustle and bustle of Waikiki is just 45 minutes away! Non-refundable cleaning fee of $125.00 is in addition to rental rates. $300.00 damage deposit fee is totally refundable if the condo is left in the same condition it was when you arrived. Do NOT get key fobs wet and be sure to return or you will forfiet your $300.00. Some seasonal rates apply for holidays and Spring break. Please inquire.